We have defined a parallelogram as a trapezoid with both pairs of opposite sides parallel. Some of our students know properties of parallelograms before getting to our high school geometry course. But they have not thought about why the properties are true. We started with a blank Geometry page of a TI-Nspire document. The first task was to construct a parallelogram using the definition. 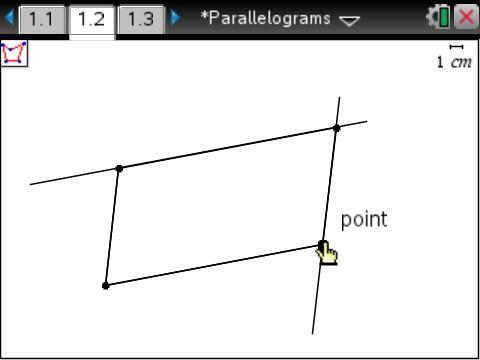 Note: Specific instructions for construction a parallelogram can be found in the Geometry Nspired activity Creating a Parallelogram. 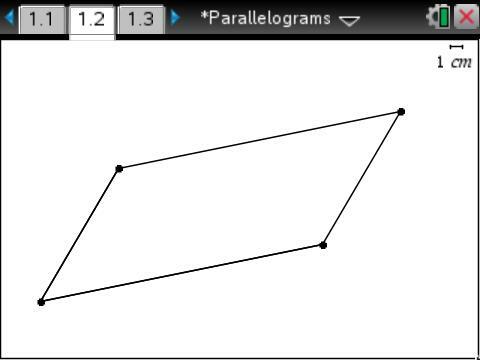 Students used several geometry tools – segment and parallel, and then they used the polygon tool to go over the parallelogram. Some hid the parallel lines and some did not. 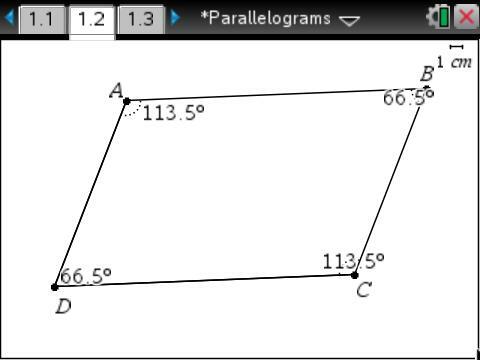 So what do you notice about the parallelogram? I gave students several minutes to explore and use measurement tools to verify their thinking. I used the Class Capture tool of TI-Nspire Navigator to watch what they were doing. And I walked around the room to listen to their thoughts. We know that opposite sides of a parallelogram are parallel because of our definition. That is how we constructed the parallelogram. What else happens as a result of that definition? 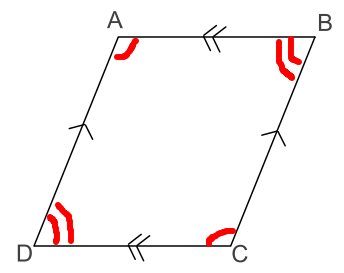 The first observation by WA was that consecutive angles of a parallelogram are supplementary. So we can observe using our technology that consecutive angles are supplementary. Can we prove that it is always true using our deductive system? Yes. The lines are parallel, and so consecutive interior angles are supplementary. The second observation by HK was that opposite angles of a parallelogram are congruent. So we can observe using our technology that opposite angles are congruent. Can we prove that it is always true using our deductive system? Yes. 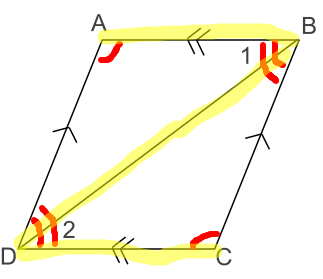 Two angles supplementary to the same angle are congruent to each other. On a side note, the sequencing of these two observations worked out nicely. It wasn’t deliberate. It was lucky that the second observation followed from the first. It would be interesting to see how students would have proved opposite angles are congruent without first noting that consecutive angles are supplementary. 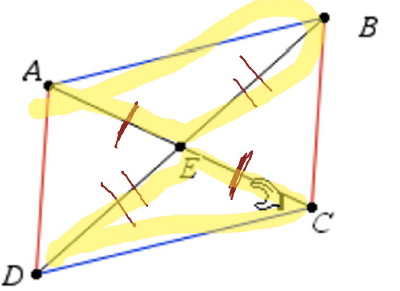 The third observation by BE was that opposite sides of a parallelogram are congruent. So we can observe using our technology that opposite sides are congruent. Can we prove that it is always true using our deductive system? We started with a picture of what we know is true. How can we use this information to prove that the opposite sides are congruent? Someone (not me) suggested that we draw diagonal BD. What do you see now that you didn’t see before? 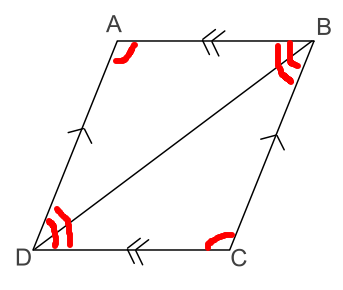 Alternate interior angles are congruent because the lines are parallel. 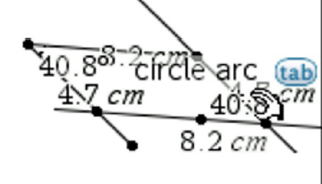 We have two congruent triangles by AAS. 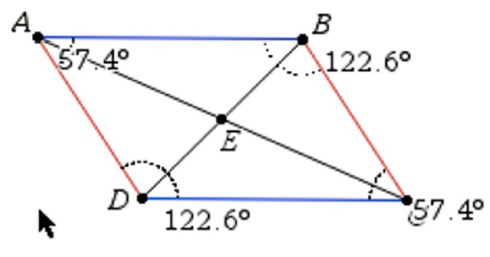 Once the triangles are congruent, the remaining corresponding parts are congruent. The fourth observation by CM was that the diagonals bisect each other. How do you know? She knew because she used the midpoint tool to find the midpoint of each diagonal and noted that both midpoints were the same as the point of intersection of the diagonals. So we can observe using our technology that the diagonals bisect each other. Can we prove that it is always true using our deductive system? More congruent triangles. Different congruent triangles, but congruent triangles nonetheless. My plan for the day was for students to prove properties of a parallelogram. We started with a blank TI-Nspire geometry page and a definition. And the students proved the properties. But it was their work and observations that got us there. Not mine.